Organizing my drawings and thoughts for presentation has required me to revisit earlier ideas. So here is how I now think this simple house may have been designed. 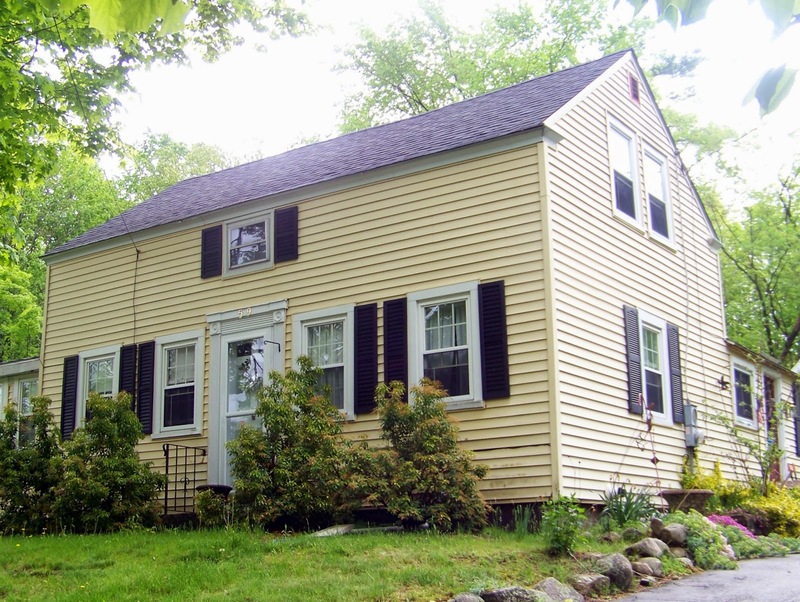 Here is a new post on this house, built north of Boston in the Merrimack watershed c. 1840. The previous posts include its history. A triangle by definition has 3 legs. If the legs are in proportion to each other so that the shortest is 3 units, the middle one is 4 units and the longest is 5 units. the triangle will always be shaped like the diagram here - with the 2 shorter sides meeting at a 90*, the longer side always the hypotenuse. 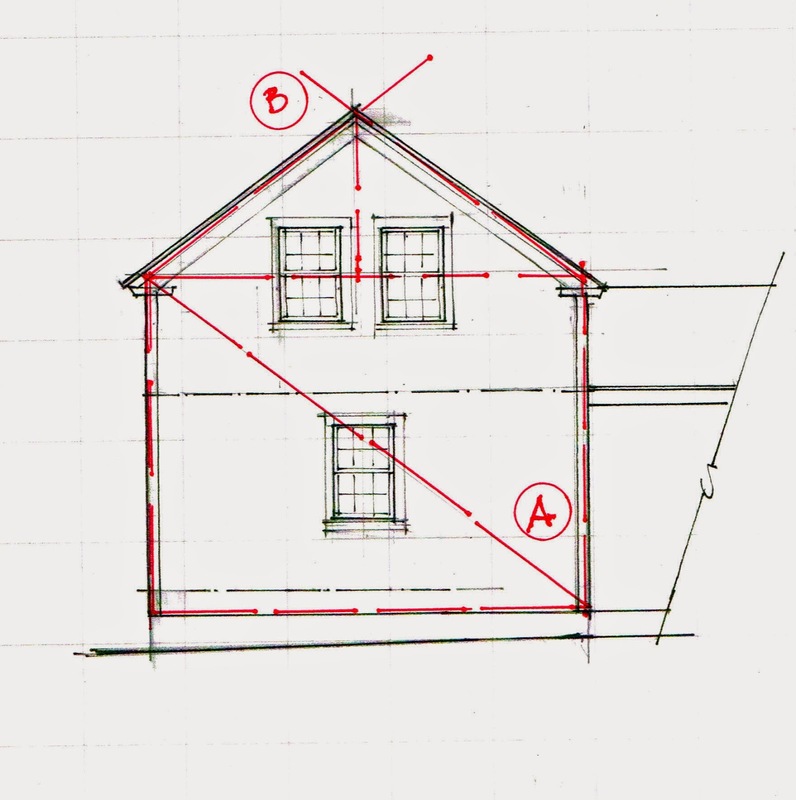 A 90*, a right angle, is what carpenters and brick layers need - a way to be sure they are erecting a stable shape that in construction will keep the loads directly over their bases and transfer those load to the ground. The wide spread availability of carpenter squares after 1820 in the United States made the 3/4/5 triangle the easy and flexible choice for layout. 2 triangles with their hypotenuses side by side made a rectangle. The long and short sides of the triangle could be flipped. 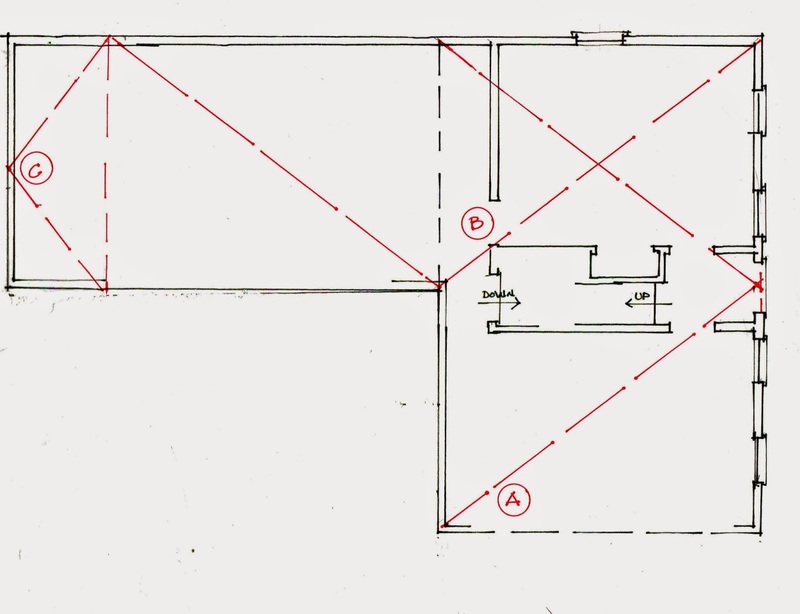 Here in the floor plan of the cobbler's house, The right side, the main house, is 2 rectangles made up of 3/4/5 triangles. (A) is the triangle laid out. 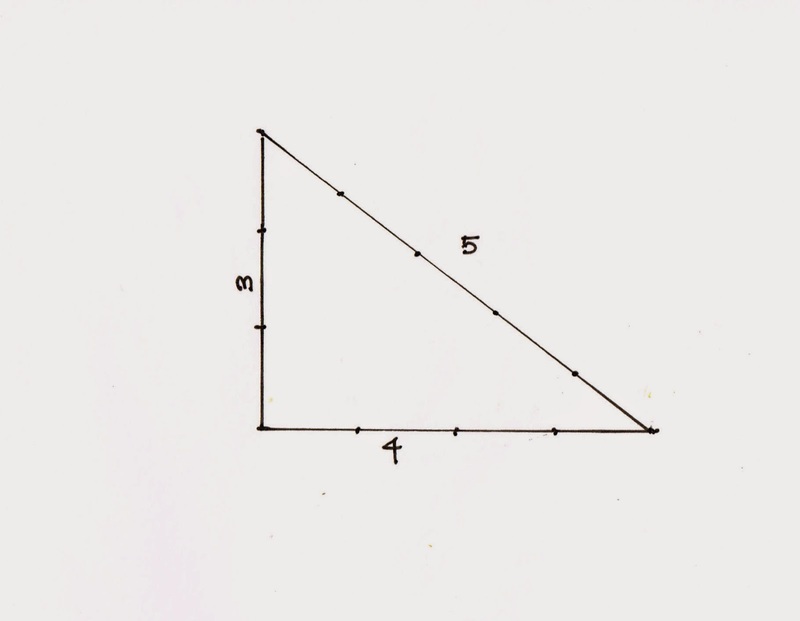 (B) is 2 triangles turned - one starts from one corner, the other from the opposite. Where they cross is the center of the rectangle. The back wing is one 3/4/5 rectangle and a little more, The size of the 'little more' (C) is determined by the 3/4/5 ratio. The rectangles of the 3/4/5 triangle can be set side by side, as they are here, or they can be slide past each other as can be seen in the diagram. 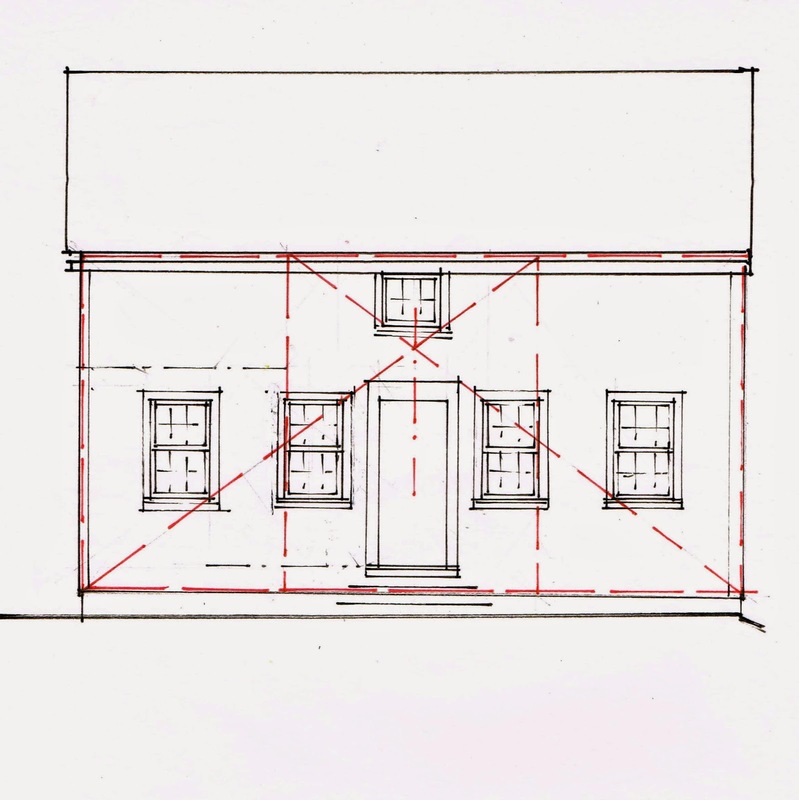 Here is the side elevation of the cobbler's house - a 3/4/5 rectangle with 2 more for the roof - arranged much as was the floor plan of the house. (A) is the main box, (B) is the 2 triangles set back to back. Add the lines for the other triangles - the diagonals for the rectangle.Where the lines cross determines the placement of the 2nd floor beam and joist (dash and dotted lines above central 1st fl. window). The intersections also mark the center of the house, thus where the 1st floor window goes, as well as the spacing between the 2nd floor windows. 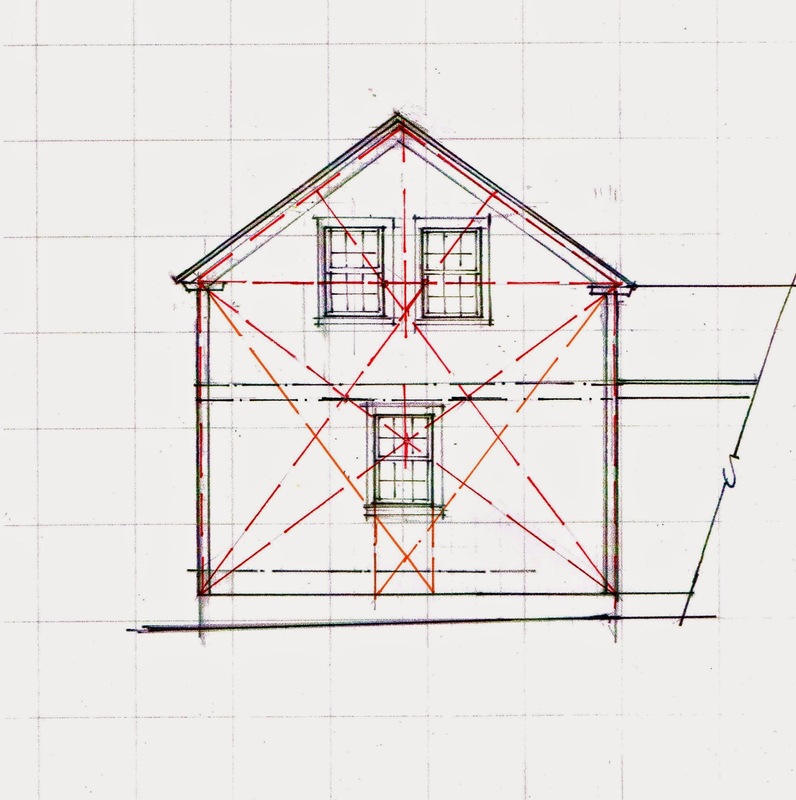 The first drawing assumed the width of the house was the '4 units' of the triangle, that the height was '3 units'. 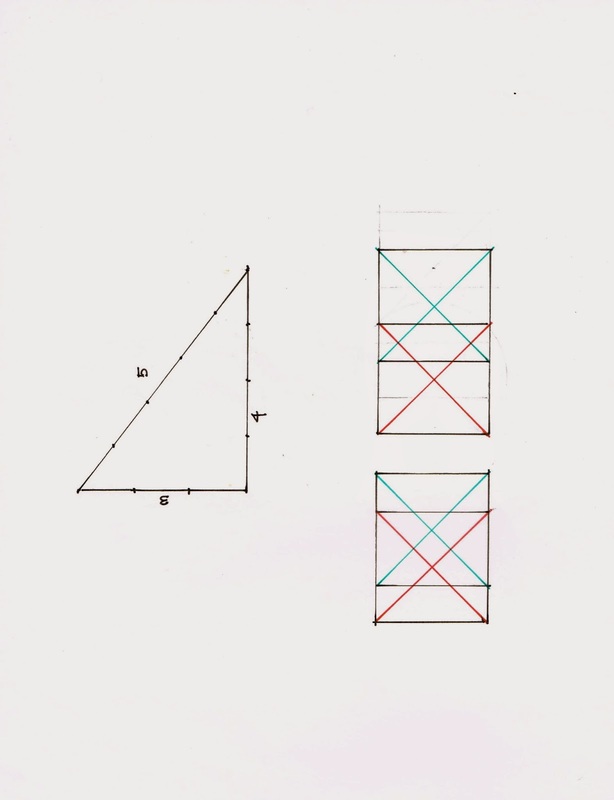 If the height is seen as '4 units', the resulting triangles cross below the 1st fl. window, That space where they cross is the width of the window. Here it is clear that the numerical length of the unit does not matter. The relationship between the lengths, their ratio, is what determines the layout. What happens on the front of the house? The front elevation is made up of 2 squares. However, the layout of the door and windows does not come from those proportions. It comes from the use of the 3/4/5 triangles - with the wall height '3 units'. The 3/4/5 rectangles, begun on each end of the elevation cross in the middle. Their edges place the windows on either side of the door. Lay out the rectangles (drawn here on the left side): the diagonals cross on the center of first windows. 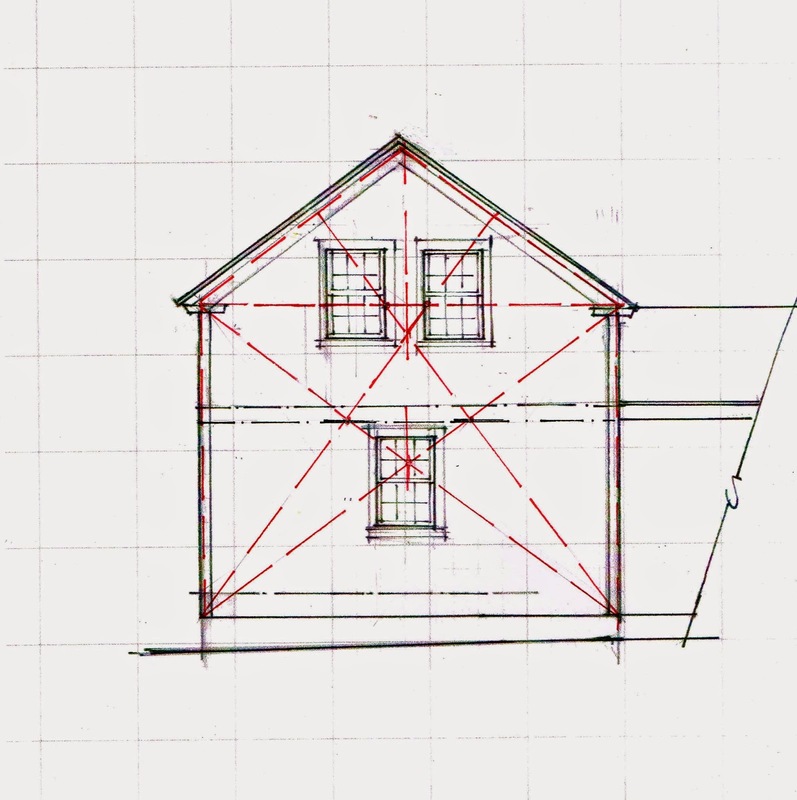 Swing the triangle to its other leg (drawn here on the right side): the resulting rectangle's diagonals cross at the edge of the outer windows and mark where to place the window jambs of the inner windows. Originally I thought that the geometry determined the design, I now think the geometry was used for the framing. The design came from the frame. These vernacular houses did not have an 'architect' but instead a master carpenter. 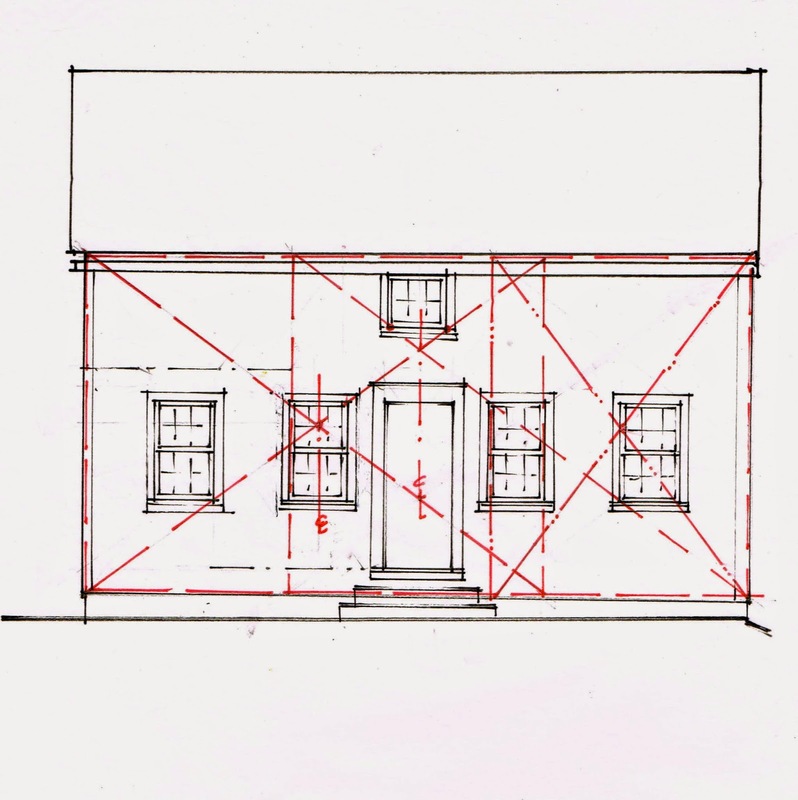 While I am sure they thought about what a house looked like, they were builders, not draftsmen. These houses resonate with us because we sense the geometry which relates all the pieces to the whole.